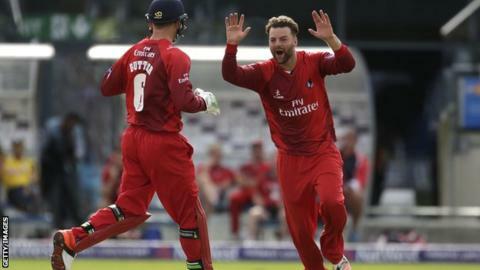 Lancashire reached their second successive T20 Blast final beating Hampshire by six wickets in a low-scoring semi-final at Edgbaston. Skipper James Vince (69) was the only batsman to adjust to conditions as Hampshire were dismissed for just 115. Spinners Stephen Parry and Arron Lilley combined to take five wickets for only 32 runs for the Red Rose county. Karl Brown hit an unbeaten 45 to guide Lancashire to 119-4 and set up a clash with Northants in the final. In a repeat of last year's semi-final, Hampshire won the toss and elected to bat. Vince and Michael Carberry made steady progress, but their opening stand of 31 was broken when Carberry was caught by Ashwell Prince off George Edwards. Edwards, playing only his sixth T20 for Lancashire, then had wicketkeeper Adam Wheater caught behind down the leg-side a ball later. Owais Shah and Vince put on 32 for the fourth wicket but Lancashire's introduction of Parry (3-21) and Lilley (2-11) changed the tempo of the innings dramatically. The pair combined to restrict Hampshire to 77-5 and then 93-8 as runs proved difficult to come by. Vince continued to see wickets fall around him as he reached a half-century from 47 balls. But he missed the chance to carry his bat for a fifth time in this year's competition as he skied a ball off James Faulkner to the waiting gloves of Jos Buttler. Hampshire were dismissed with a ball remaining of their innings for the lowest-ever score in a semi-final batting first. Lancashire lost Prince early in their reply and Alex Davies received a reprieve when he was caught off a Fidel Edwards no ball. But Brown held firm despite losing his captain Steven Croft and then England wicketkeeper Buttler to a stunning diving catch by Sean Ervine at long-off. Faulkner put any fears of a Lancashire wobble aside as he struck Chris Wood for consecutive sixes over mid-wicket to finish the game.